Now that I think about it, 2015 was an amazing year for Nonadecimal Creative. 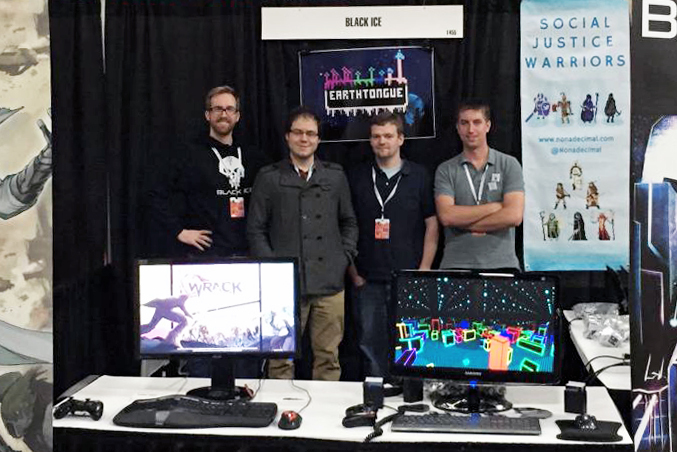 In January, I shared a booth with 3 awesome indie devs while showcasing Social Justice Warriors at PAX South. This was my first time attending a convention and also my first time running a booth. I did a video interview with IGN (another first for me) and the game was greenlit for Steam. In February, I released Social Justice Warriors on Steam after an intense month of no sleep and constant work to add achievements, trading cards, and all the other necessary Steam elements. In March, I flew to San Francisco for a single day at GDC followed by a midnight flight to Boston for PAX East where I was very grateful to have been sponsored booth space by Cooler Master. I met so many great people that week. 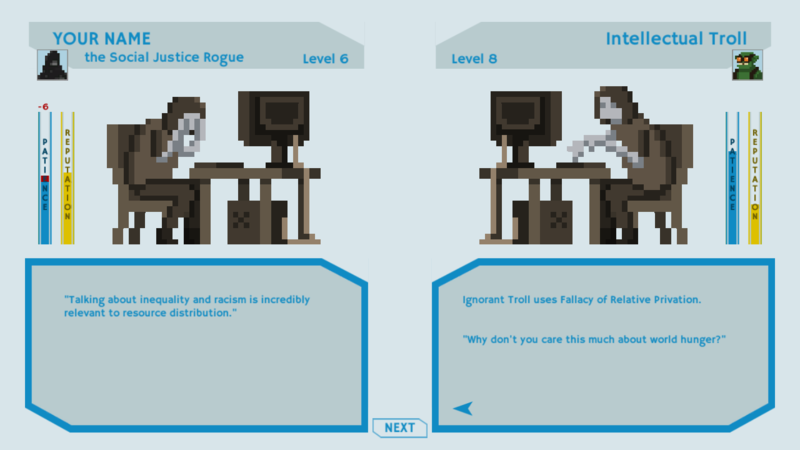 In May, I released the final update for Social Justice Warriors a year after it was first released on itch.io. In June, I started working on a cyberpunk plot generator for Black Ice that would create branching stories involving randomly generated characters. In July, I left my day job and created a new game, Automata Empire, during 2 weeks of a game jam. In November, I finally participated in PROCJAM and made a demon generator that I’ll expand into a full game, Souls & Accounting, in 2016. Meanwhile, Automata Empire was greenlit for Steam, clearing the way for its release in early 2016. So much happened in 2015 that I hadn’t even realized it was still the same calendar year! Looking back on it, the year was marked by a continuing trend toward smaller projects with tighter constraints that began in 2014. 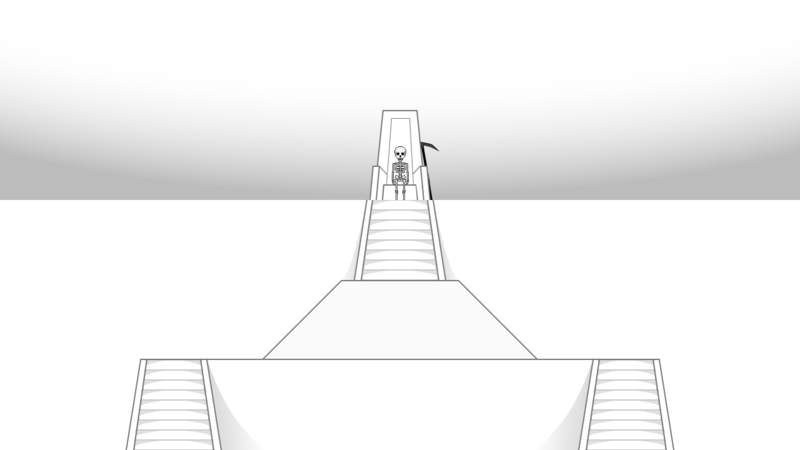 At the start of 2014, I was 2 years into development of Afterdeath, a platformer where you controlled the angle of the characters’ jumps (and for some characters, bounces). Fed up with an endless project where I felt like I had already learned all that I could, I took 4 weeks off to make and release Social Justice Warriors as a project to learn Unity and the basics of releasing a game. While I ended up updating SJW for a full year in an attempt to refine its message in the face of an ever-changing internet war, it left me feeling smaller games that offer focused lessons for me as a developer was the right idea. This challenged me to create the Automata Empire prototype in just two weeks and the demon generator in less than a week. While Automata still has some work remaining to finish the multiplayer gameplay and some menus, I feel confident it will be finished within 7 months of the initial game jam. Likewise, I think I can finish Souls & Accounting within another 7 month dev cycle. If I can hold myself to those targets, that means I’ll be able to release 2 games in 2016. Hopefully as I continue to gain experience as a game developer, I can keep shrinking that development cycle in successive years. Now that I’m self-employed, I may need those rapid releases to stay afloat too. This year has also made me realize the importance of structuring each game as a learning opportunity. Just as I used SJW to learn Unity and BIKE GAME to learn Unity’s 2D physics in 2014, I used Automata Empire to learn about managing large amounts of data (thousands of monsters traversing tens of thousands of grid cells) and tackle multiplayer synchronization for the first time. I used Black Ice and Souls & Accounting to test procedural generation theories and further my long-term goals for generating quirky, yet believable characters. And even more important are the game ideas and prototypes I’ve abandoned during the year simply because I didn’t feel I’d learn the right things from them relative to how much work they’d require to finish. I think that’s a useful lesson for all developers. Keep asking yourself what you learned and what you will learn going forward. After a brief break from dev to get married (! ), I’ll be going back to PAX South in January. I’ll be helping out at the Black Ice booth so feel free to stop by and talk to me about the plot generator and my long-term ideas for procedural narrative. I’ll also be debuting Automata Empire at the Indies Need Booze party, if you’d like to play my new game before everyone else. With both Automata Empire and Souls & Accounting gearing up to release in 2016, I’m already looking ahead to my next game that I’ll inevitably start prototyping in 2016. After asking myself what I need to learn, the obvious answer is the grammar and methodology for using semantic networks, which I will need to make more complex generative simulations, as well as the basics of long-term planning agents. With such complex subject material, you can bet that whatever kind of game it is, it’s going to be scoped small! I’m really excited for 2016 and with so many opportunities ahead, I think it will easily be an even more eventful year than 2015. Happy new year everybody! I often mention that my primary interest is procedural generation, particularly generating stories. While most of my time lately is spent trying to make small, reasonably scoped games, I really want to dive into ambitious procgen projects. So when this year’s November procedural generation jams rolled around, I decided to take the month off from finishing Automata Empire and generate stuff! First off was PROCJAM, a week-long challenge to generate something — anything — whether it’s a game or art or music or just random noise. There aren’t really any formal rules so it’s extremely accessible. Recently I’d been thinking about an old game idea from 2012 for a corporate management sim, except the employees you manage are demons selling humans consumer goods in exchange for souls. Originally I’d shelved the idea since animating an isometric office of monsters was too much work but then I reimagined it through the lens of a collectible card game with your workers represented as employee files with randomly generated polaroid photos stapled to them. That seemed like something I could complete in just a few days (since I had to travel for the last half of the week of procjam). The first step was establishing the head shapes. I decided I could add variety by layering two different head shapes to create the overall silhouette and drew eleven of them. I was pleased to discover that flipping the heads I’d drawn vertically added even more variation. Collaborating with my fiancee to draw dozens of eyes, mouths, and horns was the fun part. I found the method to derive commonly used RGB color from HSB color values, which enabled me to select random hues for the monster’s skin, suit, and features with specific saturation levels and vary the brightness so that the face layers and neck were slightly different skin tones. With all the components drawn and ready to color, the last step was placing them all intelligently. This was a step-by-step process. Suit shoulders of a random width and height are positioned at the bottom of the frame. The neck of course must be as wide as the collar of the suit, but with its own random height. And so on with the background and foreground heads. The last challenge is knowing where to place the facial features relative to the center of the head. Since I had made some of the heads radically different shapes, there needed to be a safe zone specified for each head type so that eyes weren’t floating outside faces. For lack of an easy way to derive this due to the vertical asymmetry of the heads, I decided to just define a rectangular region for each head that defined the limits for placing features. The mouths and eyes could be scaled down in size so that they’d fit the dimensions of that rectangle multiplied by the head’s scaling factor. A little vector math got the demon generator pumping out polaroids. The fun part after all that work was populating arrays of silly text to fill out the employee files. Degrees in Creative Accounting and Middle Management from Poison Ivy League schools such as Hellmouth and Harmward and Yael. Appropriately demonic skills such as Faustian Bargains and Extremely Graphic Design. With the simple generator finished, I achieved my goal and submitted to itch.io just in time to catch my flight. I’d like to pick this concept back up after Automata Empire is released in 2016 and add the corporate management logic and UI over the existing employee generator. I’d also like to improve the color generation to give some of the monsters slightly better fashion sense. Hopefully I can finish the full Souls & Accounting game by October in time for Halloween and the US presidential election. For now, you can download the simple employee generator on itch.io. I recommend checking out all 100 procjam submissions too!
. @GridSageGames @eigenbom My ideal career path is leaving a bunch of automation replacements for myself in my wake. Good thing I already had so many new projects lined up at Nonadecimal Creative. Ever since my first job programming packs of robots to work cooperatively to achieve a goal, I’ve sought to find employment where I could expand my interest in AI and engineering solutions to complicated problems. Obviously the answer was to just make my own company. So starting a little earlier than planned, I’m investing myself in Nonadecimal full time. It’s both exciting and scary to live or die by your own creativity. I have a hefty backlog of ideas sketched out over the past two years. It’s just a matter of putting them in order by their risk and return so that each project can fuel the development of the next. Here’s a tentative roadmap for 2015 and 2016. Near the end of July I tried to design a strategy game inspired by cellular automata in two weeks for the IGMC 2015 competition. I teamed up with the talented @metkis who transformed my grid of propagating numbers into fuzzy monster hordes. You can read a little more about Automon Empire here and vote for it in the competition here. I have a few more features to add this month but I like the way this simple strategy game is shaping up. If I’m really ambitious, it’ll even have online multiplayer for up to 4 players. I expect the game to be finished by the end of 2015 and released on itch.io and Steam. Throughout 2015 I’ve been experimenting with small narrative simulations. A randomly generated prison of backstabbing inmates, a neighborhood of occasionally backstabbing Victorian aristocrats, and tales of intrigue from our rapidly approaching cyberpunk future. That last one has been an ongoing project that I pitched to the friendly dev of Black Ice. I’ve been designing a procedurally generated quest system for his hack-and-shoot FPS that would provide backstory for the corporate servers you’re hacking via instant message. While it’s still rough around the edges, even the basic undecorated emails and linear plots it’s already generating can be compelling. I’ll be getting back to this project full time once Automon Empire is done, adding dynamic branches to the quests so you can sell out your employers to the highest bidder and suffer the doublecrossing subterfuge of your “coworkers” as well. Realistically I’ll keep working on the plot generator into 2016, up until the yet-unannounced release date for Black Ice. Procedural narrative has been my primary objective for Nonadecimal Creative and the work on this project is a starting point for larger scale ideas involving adaptive storytelling that focuses on the player’s choices rather than a script. Two schematics for larger games have consistently floated to the top of the pile over the last couple years, even though I haven’t found the time to take either one beyond spreadsheets and into code. In 2016 I will leverage what I’ve learned about procedural generation into one of the two. That means you’ll either be taking tactical control of a team of paranormal investigators piecing together procedural clues to prevent supernatural disasters or struggling to survive on an inhospitable alien world of your own making. Let me know which sounds more fun and you’ll get to watch it develop throughout 2016. If you read this post and got a taste of what I’d like to do in the months ahead, I hope you’ll help me stick to the timeline. Feel free to tweet me at @Nonadecimal reminding me to GET BACK TO WORK ALREADY. What’s Nonadecimal been doing lately?! After all that, I feel like I earned a few months of less intense game dev and more importantly, game playing. I made some serious progress toward my goal of beating FTL with every ship on Hard. There’s only a few left but they are HARD. I also spent some time trying other casual games such as Tales of Maj’Eyal, Hotline Miami 2, Binding of Isaac: Rebirth, and The Yawhg. The best part about the last 2 months has been the freedom to explore new prototypes without being constrained by a particular project or feeling guilty about not working on a game. I dabbled with 2 prototypes, a sandbox for testing my emotional NPC model and a cyberpunk story generator. The emotional NPCs, despite being destined for a cyberpunk game of my own, ended up in a Victorian simulation of 5 manors populated by their owners and servants. Conveniently the manors and their occupants are enumerated A-E. While I got the sandbox built, I didn’t make much progress on the complex emotional memories yet. I’ll be continuing to tinker with this as the mood strikes me. I’m more focused on the cyberpunk story generator and what may come of it. My ideas for procedural narrative, paired with the emotional simulation, go back to 2010 when I first had the terrifyingly time-consuming idea for an infinite RPG. Years later, now that I’ve actually made some decently successful attempts at making games, I feel more comfortable starting to explore that original idea in some smaller-scoped projects. I’m also still pursuing the idea of a more traditional game, a sidescrolling shooter set in an alien jungle. The alien life is composed from triangles while the human technology is made from rectangles, emphasizing their different origins. I’m still working on the design and color but I’m happy with the improvements in my second draft of the jungle scene. I think it’s good enough to start designing the alien creatures that are camouflaged by the bright plant patterns. I still have some responsibilities toward Social Justice Warriors that I’ve been addressing off and on over the past month. I pushed several bug fixes to Steam and I’m planning another semi-major update and 25% off sale coming May 11th for the game’s 1-year anniversary. It’s been a tough year for a lot of people since the game first released on itch.io. More on that in another post. Social Justice Warriors v3 Released on Steam! Big news! Social Justice Warriors v3 released on Steam on February 27, becoming the first Nonadecimal Creative title on Steam. It’s been an exciting rush of development crunch time after waiting in Greenlight limbo for nine anxious months. 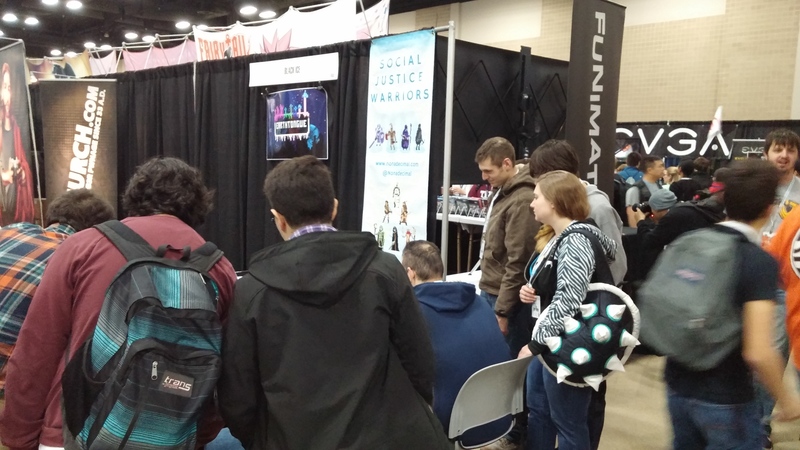 The greenlight announcement came while I was in Texas running a booth for the game at PAX South. With another booth coming up at PAX East next week, that left me only a few weeks to commission new art from the talented pixel artist Maarten Boot and new battle music from music maestro Justin Aftab, plus create art assets for Steam’s exhaustively specific icon sizes, master the Steam API for unlocking Steam achievements, and fix all the bugs and new content ideas that emerged at PAX South. Unsurprisingly, I went most of the month without sleep (it’s almost 6 am right now after another round of Steam bugs to fix) but I feel like the Steam release is nearly perfect with the v3 “Steamy” update. This is the third time I’ve updated the game since it first released in early May 2014 and looking back, it’s come a long way. The original v0 release didn’t even have sound effects! And now there’s over 300 attacks and 1600 lines of dialog in the game. If you already owned the game on another store (itch.io, IndieGameStand, Desura, Humble), you’ll be able to redeem a Steam key through your original purchase. Next week I’ll be heading to PAX East. If you’re there, you can grab one of the 10 Social Justice Warriors in the form of a pin. I’m bringing 1100 this time so hopefully I won’t run out on Day 1 again. 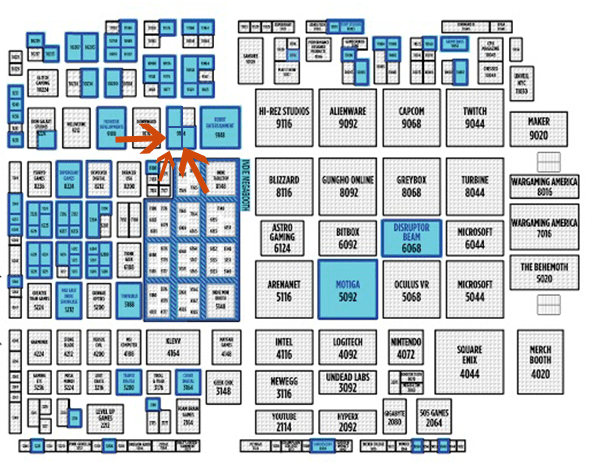 Hopefully you can spot my booth on this map. Here’s what changed in the v3 “Steamy” SJW Update! If I delay posting this any longer, I’ll risk having attended yet another PAX first! The short version: I ran a booth at PAX South for Social Justice Warriors which was an amazing success that has kept me insanely busy and sleep deprived ever since. Due to my limited vacation days from my day job, I had to fly to San Antonio the same day we had to set up our booth with only 2 hours to spare. This journey began with me finishing my last minute code to enable full-screen resolution and scaling up all the UI elements (in a game that was only ever intended to be run at a single, bizarre windowed resolution of 1024×576) at 3:00 am and going to sleep. At 4:00 am I had to wake up, pack, and catch a 2 hour bus through rush hour traffic to get to the airport minutes before my flight left. As near as I can tell, half the passengers on the plane from LAX were attending PAX and there were videogame conversations uniting multiple rows. I sat between two aspiring devs who had nothing but questions for me. This was a strange moment for me, as I’ve always felt like I was the new guy in gamedev and it made me take a look at myself to realize: not only had I released a game that was the #6 title on Greenlight, but I was about to feature it at PAX! Somehow I had become a real gamedev without noticing! Then while trying to navigate to dinner on my phone, the first bombshell hit. YOUR GAME SOCIAL JUSTICE WARRIORS HAS BEEN GREENLIT BY THE COMMUNITY. After spending almost 9 months on Greenlight with 4 of those in the Top 30 games, I’d given up hope on it ever being approved for Steam. I still have no idea why it was withheld or ultimately approved but the timing could not have been better. I had never attended an event like PAX before so I was very unprepared for what began immediately Friday morning. Fresh off the success of being greenlit for Steam, there was a camera waiting to interview me for IGN! I had been so busy getting fullscreen mode into the game that I hadn’t even sent any press emails telling anyone I’d be at PAX so I consider myself extremely fortunate that they were waiting to feature me on Day 1. I had been doing so much talking with no water that I was already losing my voice so I asked them if they could delay while I ran to buy some at the concession stand, only to discover a huge line. What I didn’t realize is that I’d run off with their mic, so back at the booth they were laughing as they heard me say “I’m supposed to do an IGN interview right now, can I please cut you in line?” over and over. Check out the fully hydrated interview and their high praise for Social Justice Warriors on IGN. Within seconds of that interview, I was grabbed by Polaris for another interview. Then APGNation. Social Justice Warriors was far more popular than I’d imagined. I’d only brought 500 SJW pins with me to give away and by the end of Day 1 they were almost all gone. The day ended with a surprise dinner invite from Rami Ismail, which of course turned into pre-dinner ice cream because we’re masters of our own destiny! My voice was so far gone by this point that I skipped all the PAX parties I’d been looking forward to and went straight back to the hotel, only to discover the IGN interview was already up. Now all day I’d been getting nothing but kind words and supportive feedback from the 500+ people who stopped by the booth to watch and play the game. Not a single person was rude to me, as I had initially feared (after getting 9 months of that from anonymous internet folks since the game released in May 2014). But back in the hotel room, reconnected to the internet, I was suddenly snapped back into the vitriol as the IGN comments piled higher (one using the “Why don’t you care this much about world hunger?” fallacy that was already featured in the game), along with two fresh 4chan threads and one new r/KotakuInAction thread. I had spent all day having reasonable and earnest discussions with people about the game’s mechanics, its message, its art, and its music that these internet comments were a colossal disconnect. I started the Saturday of PAX with the impression that I had already achieved everything there was to achieve by attending PAX and that the rest of the weekend I could just have fun and look at the other games. Fortunately, I was wrong again! I drew even larger crowds who had heard about the game on IGN. People from Day 1 came back to play the game more because they enjoyed it so much. They brought friends. The Humble Bundle invited me to add the game to their store. A Borderlands dev said they would put a social justice joke in Borderlands 3. Then another huge opportunity. A rep from Cooler Master approached me, remarking that Social Justice Warriors was an important game for the community, and offered me a sponsored booth deal at PAX East in Boston. With how successful PAX South had been and the potential to promote the game’s Steam release, it was an impossible offer to refuse. Day 2 ended with a relaxing trip to the SoundSelf guided meditation booth where I wore an Oculus Rift for the first time and plunged into a psychedelic state of relaxation. Having benefited from my own practice of meditation (how I never sleep) for decades, I really recommend this product. I got back to my booth to find a solitary dev playing SJW after hours. He seemed to be moved by the game’s pixelated characters sparring on keyboards so I sat down for awhile and we talked about the state of society and the impact making the game had on my own life. Then the rest of his party showed up to whisk him away and I never found out who he was. Such is PAX. After finding the goldilocks zone of bars (“too crowded”, “too noisy”) my unlikely icebreaker SJW pin caught the attention of a dev at the bar who turned out to be working on Star Citizen. I learned a lot about the trials of making such a huge and hugely hyped game and have a new respect for the giants among the indie community. At this point I was absolutely certain that nothing bigger could happen to top day 1 and 2. My ambition of wandering the expo and seeing other games was largely exhausted though. I did use my pizza break to stop by the Vlambeer booth and say hi to Rami. Funny story there: he hadn’t been planning to exhibit at PAX South but when he saw an empty double-sized booth that Wacom had abandoned, he seized the opportunity. I regret not taking any photos of his impromptu 20’x10′ booth but it consisted of a single table with 2 flatscreen TVs running Nuclear Throne and a simple hand-written sign in black marker that said “WIN A TV”. Rami of course had no way to transport them home on the plane. I wonder if the two lucky people who won them hoisted them over their heads and carried them, victorious, out of the convention center at the end of the day. On the final day I had some great talks with people from academic circles who were interested in the educational potential of the game. This actually meant a lot to me — as much as the monumental events of the first two days — because the reason I developed an interest in gamedev in the first place instead of pursuing a career in the sciences was because I felt like I could do more for society as an individual through videogames. You can see some of my vague education-oriented ambitions on the site too. But most importantly, PAX as a whole validated the reason I made the game. It wasn’t meant to change the world or fix the problems that grew to plague the videogame community since its release. It wasn’t even meant to tell people to be nice to one another. Social Justice Warriors is nothing more than a question. You bring your background and preconceptions into it and it asks you the why and the how but it’s still up to you to answer those questions and think about your role in online communities yourself. Online, the loudest voices I hear are usually the angriest and there are thousands upon thousands of comments out there insisting the game is terrible and contributing to the ongoing downfall of civilization. But after listening to those thousands of people at PAX tell me their personal stories and what they saw when they looked in the game’s reflection, it felt like it really was making a difference on some level. At the very least a small nudge to get the ball rolling. Of course the trip ended the same way it began. I left the expo Sunday evening and spent the entire night in the airport working to fix the bugs I’d seen during what was essentially a 20 hour playtesting session. Then because I’d already been awake for two days, I stupidly overwrote all instances of the game’s code with the code from the v2 update two months earlier! I am a walking PSA for why you should always use source control. But since SJW was a “simple 5 week project that I’d never work on again,” I’d never set up any versioning history. Lesson learned. And that is the story of how I ended up staying up a third night in a row learning how to pirate my own game. A few weeks later and I am still dealing with weird spaghettified pirate code and sleeping 3 hours/night as I grapple to get the Steam release ready before PAX East. If you’re in Boston, stop by Booth 9164 to play Social Justice Warriors and share your story. Also grab one of the 1100 pins I’m bringing (lesson learned!). You can grab Social Justice Warriors on Steam starting February 27!! 2014 was a big year for Nonadecimal that marked a transition from “hobbyist” to “real game dev.” Here’s what happened last year. Halted development on Afterdeath after almost 2 years. It was being developed on Microsoft’s XNA framework which they discontinued support for at the end of 2013. I couldn’t get XNA to run smoothly on Windows 8 either. Without extra porting work, my release options were limited to XBLIG on the Xbox 360 and non-Windows 8 PCs. Focusing on a new project seemed like a better use of time, especially since learning to make games with Unity would expand my release options. Released Social Justice Warriors. I made SJW in April as an expression of frustration with how I saw people treating each other online. After working on Afterdeath for so long, a short project was refreshing. I released SJW on May 11th after a 5-week dev cycle. Over the course of 2014 it sold more than 7000 copies, reached the #6 spot on Steam Greenlight, raised $200 for suicide prevention, and was invited to enter the Games For Change awards. Attended GDC and Indiecade. After being part of the gamedev community for a few years, it was great to interact with other devs in person. Talking with them and seeing their projects was a big influence on the decision to stop working on Afterdeath and release SJW. Started development on BIKE GAME. At Indiecade my girlfriend had an idea for a game to enter in the Leap Motion game jam using their hand-sensing controller to steer a bike. While the jam ended up being for 3D games only, we started making our 2D BIKE GAME together, splitting the code and art. You can play it now and win free games as part of the 2014 Festivus Showdown. I learned a lot about development, marketing, and the videogame ecosystem in 2014 so I think 2015 will be an even stronger year for Nonadecimal. We’d like to release BIKE GAME early in the new year once its reality-shifting mechanics are perfected. I’ve been trying to decide which of 3 new game projects to work on for the rest of the year: a cubicle roguelike set in the 90s, an abstract sidescrolling shooter about a terraforming accident, or a larger squad-based strategy game. I’ve been slowly working on a few story-telling projects for other indie games that will continue in 2015. 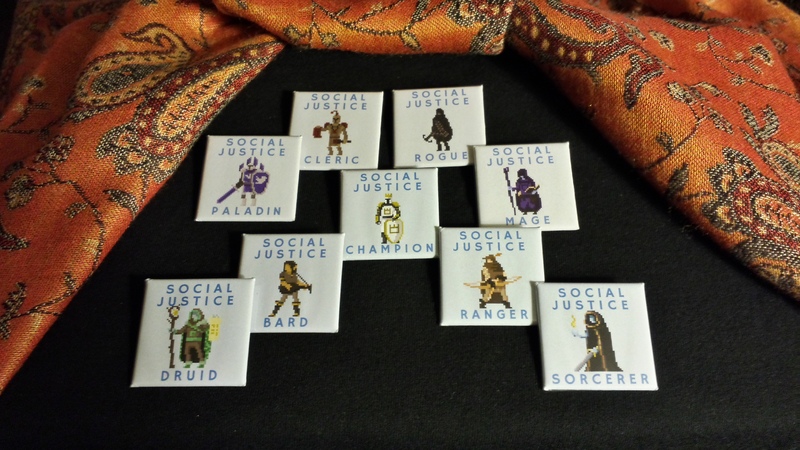 I will have a booth at PAX South in January with Social Justice Warriors and BIKE GAME available for play. I’ll also be attending GDC and Indiecade again after enjoying those last year. Have the standard consumer holidays left you feeling gloomy? Downtrodden by the abundance of cheer? There’s a cure for that. It’s Festivus for the rest of us! Get free videogames* for playing videogames! Sounds easy, right? Then you’re ready for the 2014 Feats of Strength. For Nonadecimal’s First Annual Festivus Giveaway, bright-eyed consumers threw themselves at the merciless levels of Afterdeath for the chance to win two Ouya consoles. But that was last year. This year, 21 champions will walk away with a free game of their choice. But to get the game of your dreams, you’re going to have to claw your way to the top of the Festivus pole. That’s where BIKE GAME comes in. A cyclist’s nightmare on an infinite highway. Play it free on Game Jolt, take a screenshot of your farthest distance, and tweet it with the hashtag #BIKEGAME. What are you waiting for? Go ride bikes! And if you actually read down this far, let me make you a deal. Retweet the tweet below and I’ll add an extra 50 meters to your score.